Blackwolf Workout is a fitness solution that claims to promote physical performance in both men and women. The unique workout product has a stack specially designed for both the male and female physique. In this review, we’ll see if this product works any better than the other thousand workout solutions online. I’ve also included the online pricing as well as the final verdict on the product. Tired of taking an assortment of bad-tasting pills and workout supplements every day? Unhappy with the results and benefits of your current supplement/stack? Mixing different supplements causing unexpected side effects? If so, this new workout supplement pack might be what you are looking for. This is because Blackwolf Workout is an all-in-one workout solution designed with premium ingredients for some fast-acting results. 2 Why Is There A Different Workout Pack For Men And Women? 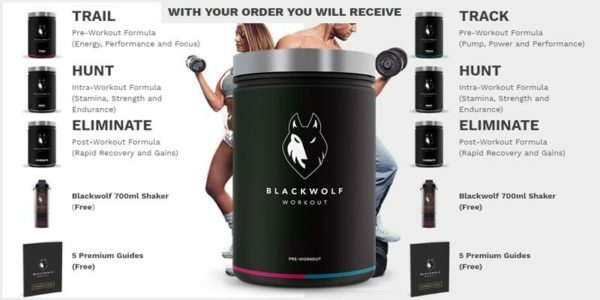 8 How To Buy Blackwolf Workout? BlackWolf Workout is designed by veterans as a top tier workout performance booster. That is to say, it’s intended for men and women who want to achieve their full workout potential. In fact, this product comes in two different Premium Packs which are designed for men and women. The reason for this different approach for the different genders is because men and women have different body chemistry. Consequently, this means that they require a specially designed blend of ingredients to give them the best results. Why Is There A Different Workout Pack For Men And Women? The proprietary formula, Blackwolf Power Blend™, is intended specifically for the body chemistry of men and women. In fact, this may help you reach new heights regarding workout performance. Blackwolf Hunters Pack that contains Track, Hunt, and Eliminate. Blackwolf Huntress Pack that contains Trail, Hunt, and Eliminate. Both premium packs come with a shaker bottle and five premium guides completely free. 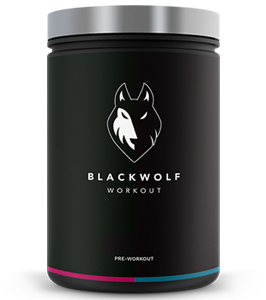 Blackwolf Track is a pre-workout supplement designed explicitly with the male body chemistry in mind. This supplement boosts your energy levels and focus during training, allowing you to take your workouts to the next level. In short, this workout formula will make sure your week’s third workout is as intense as your first. Blackwolf Trail is a female-oriented pre-workout supplement. That is to say, it is designed to promote intense workout sessions with loads of energy and enhanced concentration for women. This is one of the few pre-workouts designed specifically for women and can help shed fat while toning muscles. In fact, Trail aims to convert fat into energy and boost endurance, giving you results as fast as possible. Blackwolf Hunt is a powerful intra-workout blend. This certainly means that you can expect a boost in strength and stamina to help you get through the toughest workouts. In other words, it provides you with the strength, stamina, endurance and focus needed to succeed. Moreover, Hunt is a great partner for those intense workout sessions. So, it can be used to turn fat into energy and make your workout goals into reality. Blackwolf Eliminate by Blackwolf Workout is as essential to your workout as Hunt, Track or Trail. In fact, this workout formula is considered to be a premium post-workout blend because of its balanced carbohydrate and protein concentrations. Therefore, it should be taken within the ‘anabolic window’ time of 30 minutes after a workout. This is to maximize your workout gains and improves recovery while reducing fatigue and muscle soreness. The manufacturers claim to have designed the workout supplements in such a manner that you will not experience any side effects. In fact, the ingredients of these supplements are clinically tested and are mentioned on the bottles. This is unlike sub-par products from sub-par manufacturers who frequently hide the ingredient list due to their low-quality ingredients. Each workout formula contains a unique blend of ingredients. Consequently, they are designed to give you optimal benefits from the potent ingredients used. in fact, the proprietary formula, Blackwolf Power Blend™ provides you with the benefits without any side effects. To summarize, I’ve listed the ingredients in each Black Wolf Workout formula. *This ingredient is unique to either Track or Trail. Beta-Alanine is a bodybuilding ingredient that is used in all four products. This amino acid is beneficial as it’s proven to increase carnosine levels in the muscles. In addition, it’s found that higher carnosine levels reduce workout fatigue and improve physical performance. It’s also shown to enhance muscle growth and endurance in professional athletes using Beta-Alanine supplementation. Caffeine is another stimulant that all four products use. In addition, this ingredient has long since proven to improve metabolism and increase energy levels. Zinc is also used in all Blackwolf products. This mineral is used to combat Zinc deficiency which can lower testosterone levels. While zinc supplements increase testosterone level, they are perfectly safe for females to use. Black Wolf Workout is an all-in-one workout solution for men and women. It is also great for those who don’t like taking multiple pills to get the results they desire. That is to say, these pre-intra-post workout packs are designed to give you the best workout benefits. And while they work best when taken as a stack, they are also useful when taken individually. Wolfson Berg Ltd. from Cyprus makes this workout solution. I’ve had previous dealing with this company. Subsequently, I know this is a well-reputed supplement manufacturer with several other successful products in the market. 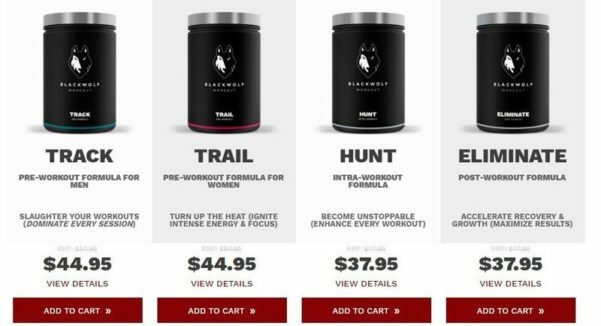 How To Buy Blackwolf Workout? Blackwolf comes with two premium workout packs, Blackwolf Hunters Pack and Blackwolf Huntress Pack. But like other online products, you can only get the best price from their manufacturer’s site. Of course, if you want to get these deals, your best option is to head to the manufacturer’s site. You can benefit from this workout product, whether you are male or female. And the freebies and discounts on the Hunter/Huntress pack also make it worth buying. So, in conclusion, if you want a bodybuilding booster with zero side effects, Blackwolf Workout is for you. Q: Has this product been supported by professional athletes? A: Yes. In fact, Ekow Essuman, a professional boxer and Ekaterina Avramova, a professional swimmer have supported the Blackwolf packs. Q: Can I skip a few days without experiencing any problems? A: You can start and stop using the products whenever you wish. However, regular use will provide the best long-term results. Q: What is the dosage like? A: The dosage for each product is mentioned on the jar labels. The official website also provides the same information. Q: Can I get these products in pill form? A: These products are only available in powder form. The body is clinically proven to absorb powered supplements better than pills. Q: Can I buy this product on Amazon? A: Blackwolf Workout is only available on the manufacturer’s site.